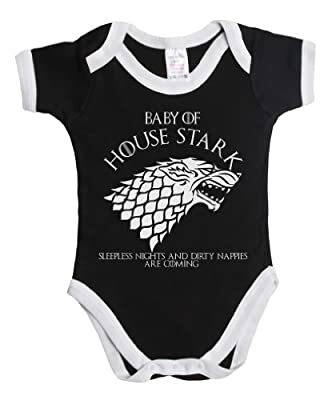 A funny unique unisex baby grow that will make a perfect gift and great talking point. Design is filed,dated and copyright of Buzz Shirts, 100% unofficial and not endorsed by anyone featured. Names are for descriptive purposes only. 100% quality cotton unisex vest with 3 button fasteners and contrast colour trims. Printed using state of the art screen print equipment which will not crack or peel when washed. Fully machine washable.Always check label for wash instructions. Available in sizes newborn, 0-3 months, 3-6 months, 6-12 months,12-18 months and 18-24 months.